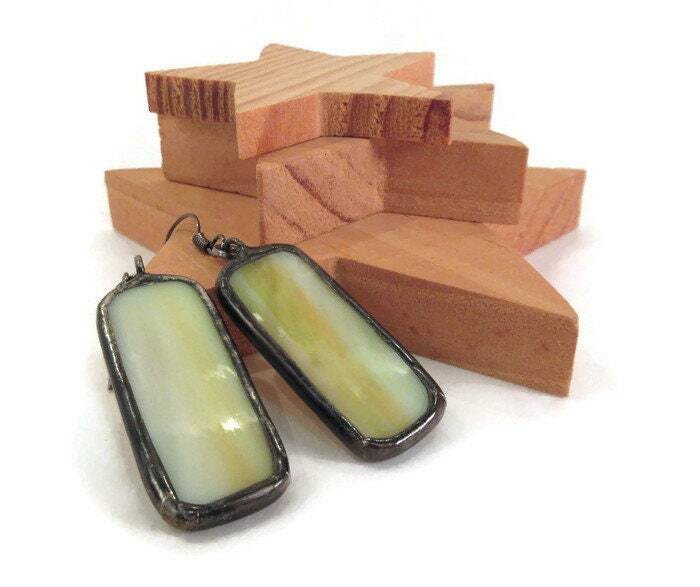 Yellow Green Streaky Glass Earrings, made with a Streaky Yellow Green Stained Glass shaped like a rectangle. These unique yellow green earrings are created by cutting streaky yelllow green stained glass into a rectangle, wrapping with copper foil and applying a layer of lead free solder, then o rings are attached for hanging the ear wires, the pieces are then cleaned and given a rich dark patina and polished with jewellers wax. They come hung on black ear wires and sent in a handmade fleece bag which is ready for gift giving or safe keeping. ****These stained glass earrings can be a little heavy for folks who aren't used to wearing dangling glass earrings.